Patients recovering from life-threatening blood clots are working out to a fitter future with a unique new exercise programme available at the Royal United Hospital in Bath. Regitse Lewis, RUH Therapies Team Leader, said: “These classes are a great introduction back into routine exercise in a safe environment with professional support on hand. 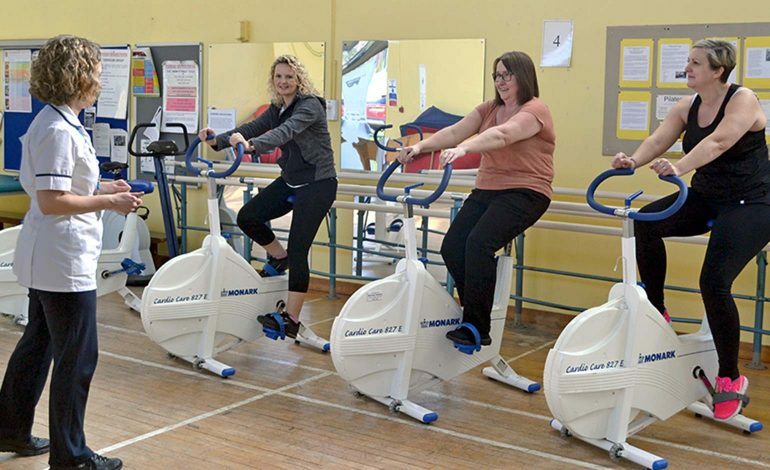 “We tailor each session to the abilities and needs of those attending, but an average class could include walking, exercise bikes, weights and stretching. Patient Simone Vandermeer from Bath said: “I was terrified to exercise again, I knew it would help me recover but I didn’t know what was safe and how far I should push myself. “At first I couldn’t even walk from one end of the room to the other without getting completely breathless. Now I can easily get round at least four or five laps. The funding for the classes was secured thanks to a successful bid to the Trust’s Innovation Panel – where staff can pitch for funding to finance projects that will improve patient care and experience or will increase efficiency. Consultant Haematologist Dr Mark Robinson said: “A pulmonary embolism can be a terrifying disorder and our experience is that patients are fearful to get moving and exercise after a diagnosis. “However research shows that regular exercise reduces both risk of reoccurrence and risk of bleeding for patients on anticoagulants. “The programme is designed to install confidence, help patients get back to normal as quickly as possible and develop new healthy habits. To our knowledge we are the only hospital in the country offering such a targeted programme. “We approached the Innovation Panel when we identified a gap in provision for patients who were fearful to exercise after suffering from a pulmonary embolism. “This is reflected nationally too – if you have a heart attack then cardiac rehabilitation is offered, if you have chronic lung disease then pulmonary rehab is offered. To find out about symptoms, treatments and ways to reduce your risk of a pulmonary embolism, visit www.nhs.uk/conditions/pulmonary-embolism.